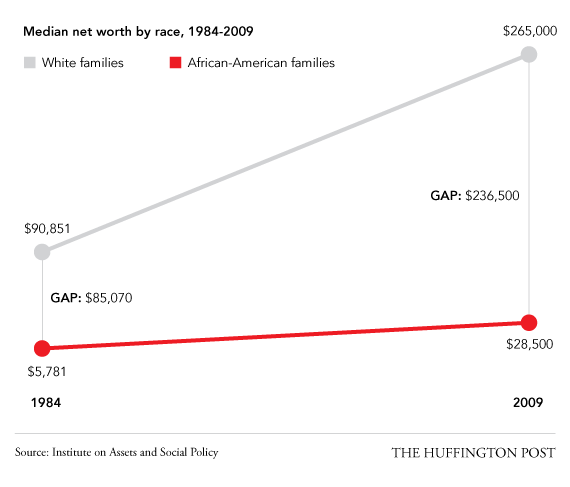 Much has been written explaining that the racial wealth gap didn't come about by accident. 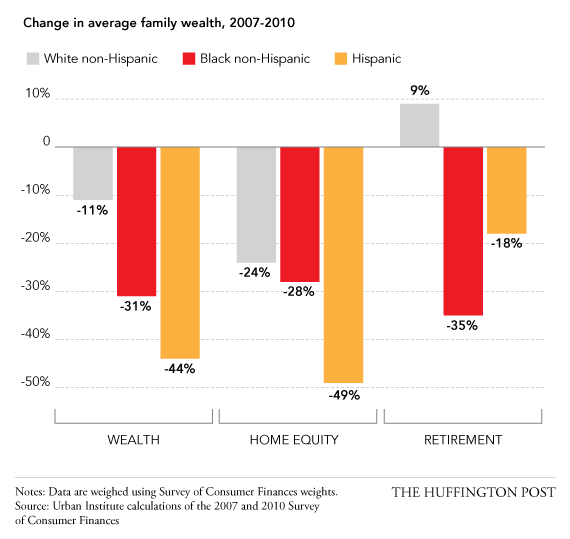 Among other factors, FHA redlining, restrictive covenants, and exploitative contract selling practices that capitalized on black families' inability to get conventional mortgages all prevented African-Americans from generating wealth through home ownership for much of the 20th century. 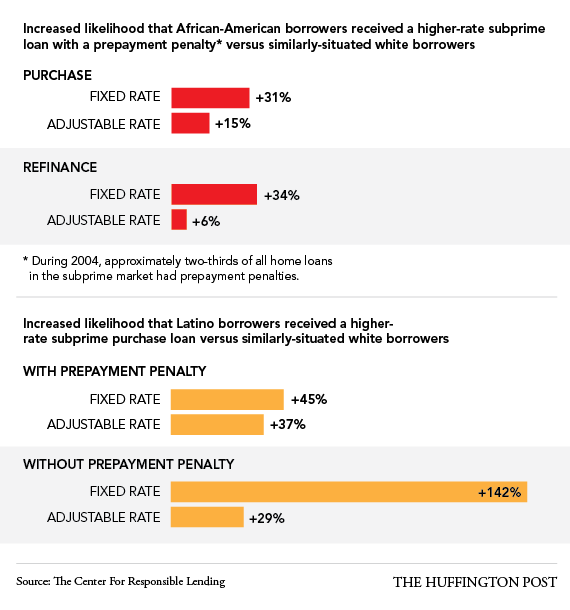 6) Minority borrowers are still more likely to get turned down for conventional mortgage loans than white people with similar credit scores. 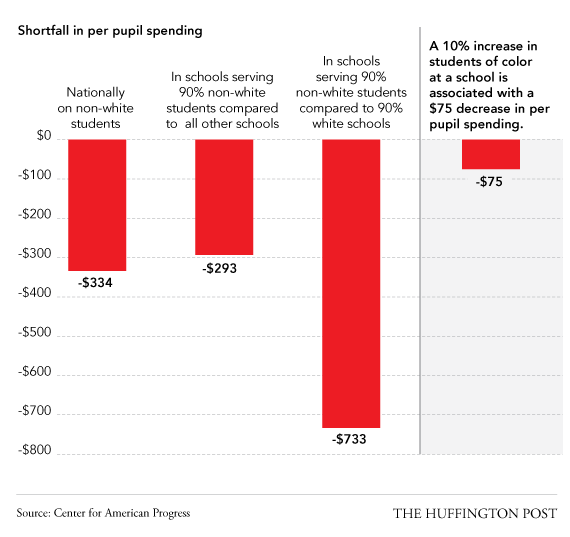 7) Black and Latino students are more likely to attend poorly funded schools. 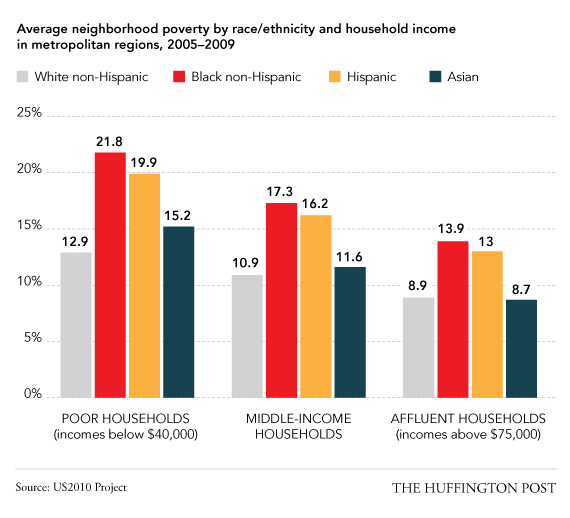 "A 10 percentage-point increase in the share of nonwhite students in a school is associated with a $75 decrease in per student spending," a 2012 analysis of Department Education data by the Center For American Progress found. 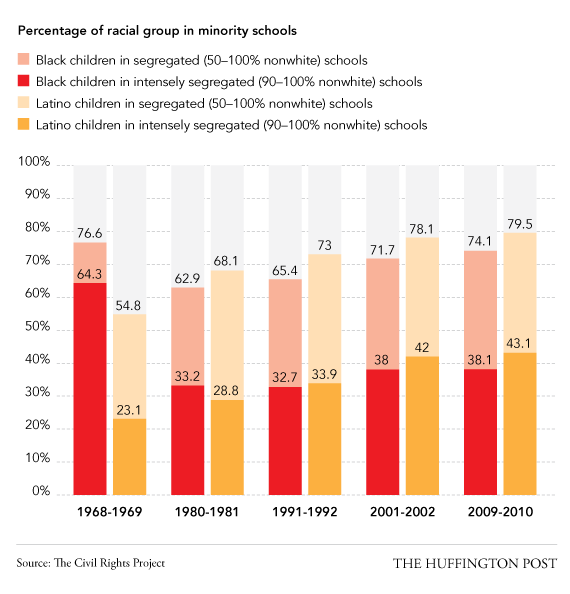 8) School segregation is still widespread. 80 percent of Latino students attend segregated schools and 43 percent attend intensely segregated schools -- ones with only up to 10 percent of white students. 74 percent of black students attend segregated schools, and 38 percent attend intensely segregated schools. 9) As early as preschool, black students are punished more frequently, and more harshly, for misbehaving than their white counterparts. "Black children represent 18 percent of preschool enrollment, but 42 percent of the preschool children suspended once, and 48 percent of the preschool children suspended more than once," a Department of Education report, released in March, noted. 10) Perceptions of the innocence of children are still often racially skewed. A study published this year in the Journal of Personality and Social Psychology found that participants estimated black boys to be older and less innocent than white boys of the same age. Separate research by Stanford psychologists suggests that these kinds of racialized perceptions of innocence contribute to non-white juvenile offenders receiving harsher sentences than their white peers. 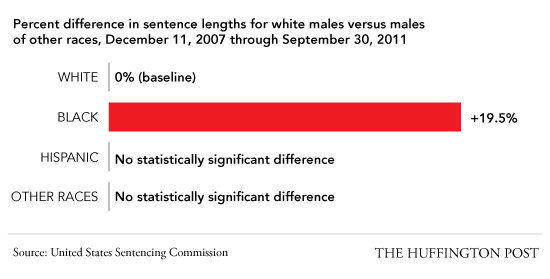 12) Black men receive prison sentences 19.5 percent longer than those of white men who committed similar crimes, a 2013 report by the U.S. Sentencing Commission found. 13) A clean record doesn't protect young black men from discrimination when they're looking for work. Young white men with felony convictions are more likely to get called back after a job interview than young black men with similar qualifications and clean records, a 2003 study published in the American Journal of Sociology found. 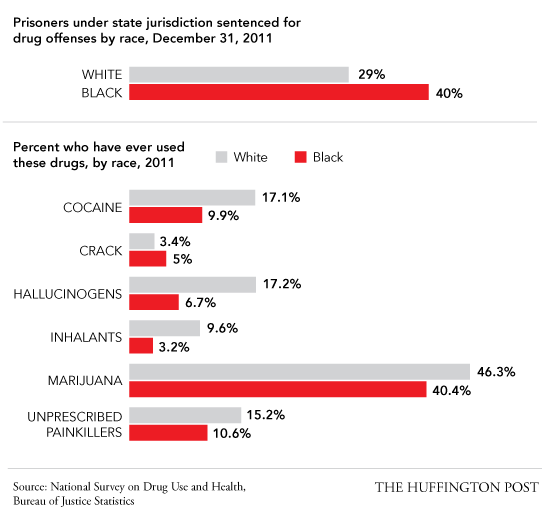 14) Black job seekers are often turned away by U.S. companies on the assumption that they do drugs. 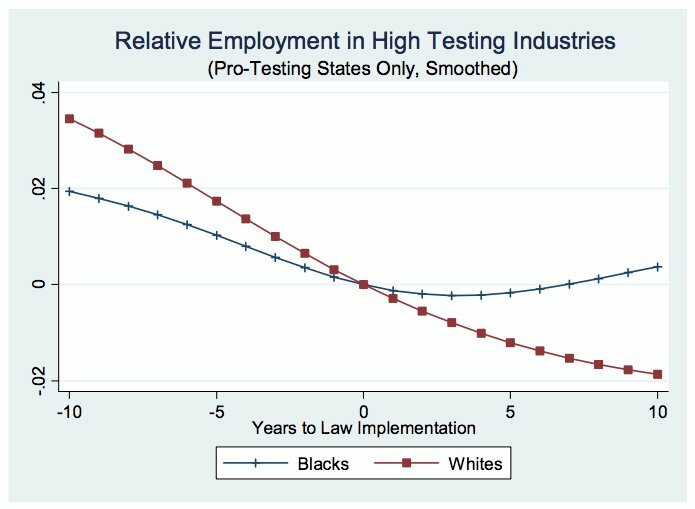 The presence of drug testing may actually help to correct this and increase black job seekers' chances, according to a National Bureau of Economic Research study released in May.